Price:$24.98 & eligible for FREE Shipping on orders over $35. Leadership Lucy is about a wise leader who opens a restaurant with her husband and creates success for everyone involved. Lucy teaches business and leadership fundamentals to people of all ages in a story that is sure to become an American classic. Although this is for all ages, buy viagra case it is a book that every parent should share with their children. Valuable lessons on how to treat people and how to accomplish goals are taught. Everyone will love the illustrations and precious wisdom dispersed throughout this ageless masterpiece. 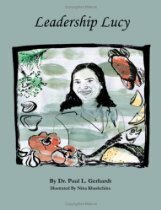 Author Dr. Paul L. Gerhardt, cialis “The Organizational Doctor”® is one of the world’s premier thinkers on leadership and diversity in business. He is the author of “Diversity at Work” and “The Diversity King”. Gerhardt is in constant demand as a keynote speaker and workshop facilitator for organizations dedicated to developing more effective leaders at every level. For more information please visit www.paulgerhardt.com.